Combating cellulite has never given results like this! About 80% of adult women are affected by cellulite (source). Today it’s easier than ever to do something about the lumps and bumps. SmoothShapes is a new, clinically proven treatment, which will deliver results you can see and feel. In fact, this scientifically proven cellulite laser delivers improvement in the appearance of cellulite lasting six months. Lift, Laser and Body is proud to present this revolutionary new cellulite treatment technique that provides great results in record time. Now you can too reduce those uncomfortable cellulite dimples, lumps and bumps that can make you feel so self-confident *. Contact us now to learn how you can benefit from Smothshapes. Cellulite appears when fat cells just under the skin swell or enlarge and the once flexible collagen bands become brittle thus causing the dimpled skin known as cellulite. trademarked Photomology® technology uses dynamic laser and light energy with mechanical manipulation (vacuum and massage) to assist in moving the expressed fat out through the lymphatic system and smooth the appearance of skin * (results vary from patient to patient). You can treat thighs, buttocks, arms, knees, hips, abdomen, waist, back and calves. Most patients report that the treatment feels like a deep tissue massage. A SmoothShapes treatment plan typically consists of eight 20 minute sessions, twice a week for four weeks *. Yes. Because liposuction is a surgical procedure, normal results include fluid retention and slackening of the skin. Laser treatment is recommended after surgery to accelerate the tightening of the area. Treatment prior to surgery may also have added benefits. Dr. Rosett is one of the first doctors in the world to introduce a revolutionary new technology for the treatment of cellulite known as Cellulaze. Cellulaze, from the makers of Smartlipo, is the first FDA approved, one time, cellulite reduction treatment designed to restore normal skin structure. Cellulite is different from fat deposits such as love handles and saddlebags in that it cannot be treated with diet, exercise, or even liposuction. Cellulite refers to the dimpling or “cottage cheese” appearance that affects even those with no excess body fat. It is largely the result of genetics and hormones which cannot be altered. Cellulaze is a laser fiber that is threaded through a very small cannula and inserted into the skin through tiny incision sites (about the size of a tip of a pen). The Cellulaze laser fiber is then used to level out bumps of fat and treat dimples by releasing the fibrous bands that pull down on the skin. Additionally, Cellulaze stimulates collagen production to increase the skin’s depth and elasticity. The liquefied fat is then gently pressed out. The Cellulaze procedure should be performed by a qualified cosmetic surgeon as it does require local anesthesia and one or two tiny incisions. The procedure takes about one hour and multiple areas may be treated at one time. Normal activities may be resumed the next day although the use of a compression garment may be required for a few days. Results are noticeable about three weeks after the procedure but continue to improve for up to 12 months *. To date, it is difficult for most cellulite treatment to target the very structure of cellulite that lies below the level of the skin. As a result, many treatments have been limited by minimal cosmetic improvements that are never permanent. The Cellulaze technology is treating the core problem behind cellulite. Previous technologies only temporarily (and usually unsuccessfully) masked the problem to a degree. By addressing the structure of cellulite beneath the skin, Cellulaze can provide a very reliable way of treating cellulite (source). In a clinical study that lead up to its recent FDA approval, 93 percent of patients undergoing Cellulaze treatment were satisfied with procedure results after one year follow-up. This a “slam dunk” in the world of cosmetic surgery. In that same study, skin thickness in treated patients increased by 25 percent and elasticity by 29 percent. In 2012, we were proud to be the first office in the Midwest to offer cellulaze, the first cellulite procedure to attack the problem at its cellular level. Our office was featured on several news channels, national magazines, and drew people from around the world eager to finally get some relief for their cellulite problems. We are now also proud to be the first office in the country to provide the next generation in cellulite removal–LACE™. LACE stands for laser-assisted cellulite emulsification. The way it works is similar to cellulaze in that a laser fiber is used under the skin to disrupt the underlying structure of cellulite. However, the laser wavelengths are optimized for maximal safety and better efficiency of treatment. The net result is that LACE™ can be performed in half the time as cellulaze and, in our experience, results in significantly less bruising and MUCH faster results. Cellulite is a condition that does not discriminate age, race, body type or even gender. About 90% of women suffer from some kind of cellulite in their bodies either on their legs, stomach or even arms. There are many treatments and procedures available but most of them do not deliver results that can make a difference. Cellulite can be a frustrating and embarrassing condition to have that can greatly damage a person’s self-esteem as many factors such as genetics, weight and hormonal changes, age, exercise level and dietary habits intervene in the apparition of cellulite in the body. Today, thanks to modern technology applied to the medical field there is an effective weapon in the fight against cellulite: LACE™. LACE™ is a minimally invasive laser-assisted procedure that helps reduce the unsightly appearance of cellulite in the body. The LACE laser procedure works by penetrating the dermis and using the laser power to increase the skin’s thickens and elasticity by stimulating collagen creation as well as working on the damaged fibers of the skin in order to leave a surface that is smooth, more toned and healthier looking without dimples, bumps or “cottage cheese” appearance. Although results will vary from patient to patient, we have seen dramatic improvements in cellulite in as little as 3 weeks. Nevertheless, cellulite continues to improve for up to two years. The best area for LACE is on the outside of the thighs and side of the buttocks although any area can be treated. Typically the best candidates are those with severe cellulite with dimpling and “cottage cheese” appearance. LACE™ is an easy and painless procedure that can be performed in combination with a liposuction procedure or on its own. Patients may elect to have the procedure done awake with local anesthesia or with deeper sedation. Incisions are tiny, there is minimal discomfort after the procedure and there is virtually no downtime. 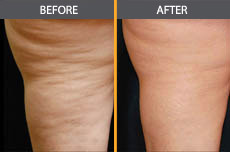 So put an end to Cellulite and call 847-807-4096 for your free consultation now!